La Liga is one of the most prestigious league football competition in the World which is based on Spain. In every season, there are twenty clubs used to compete in La Liga every season. 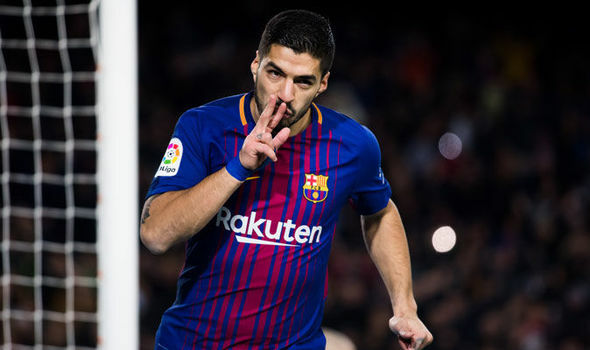 And so, Barcelona striker Luis Suarez believes that Real Madrid not the only rival of title but also there are number of teams are still in the race of title in the season. In La Liga, everyone is waiting for the El Clasico which is going to stage in upcoming week at the home venue of Real Madrid. But to the race of the title, Real Madrid is not the only competitor which is believed by the Uruguayan forward Suarez. Considering his opinion, in the race there are other teams as well. In next Saturday at Santiago Bernabeu, the first El Clasico in the ongoing season of La Liga will be staged where Barcelona will face Real Madrid. The match would be tough for Barcelona because they will not get the ground support. Against their top rival at the away ground, to manage victory would be a tough job. Barcelona already played sixteen matches in la Liga where they won thirteen matches and drawn thrice times. They yet to face any defeat in the season. So, with 42 points they are in top position on the La Liga point table. With six points behind, Atletico Madrid is in 2nd position. Valencia is in 3rd position with 34 points. On the other hand, current champion Real Madrid played 15 matches and their point is 31. With that they are in 4th position. Considering the El Clasico at the Real’s ground Barcelona striker killer Suarez stated that Win there would be a plus point but they have still other opponents. Valencia and Atletico Madrid are chasing them currently. At Camp Nou in last Sunday night, Barcelona simply destroyed Deportivo La Coruna by 4 – 0 goals and through the victory they have secured their top position on the point table. In the match, plenty of shots were stopped by the goal post otherwise Barce could get a huge victory there. Considering the post obstacles in the season, team Barcelona is in the top out of the five top European league competitions. In La Liga, till now total 19 shots of Barca were stopped by the goal post. Due to that Messi was also disappointed in the match against Deportivo. He even could not score in penalty against the team Deportivo. But, his companion Suarez is not worry about his mate Messi. He believes that Messi is the one.